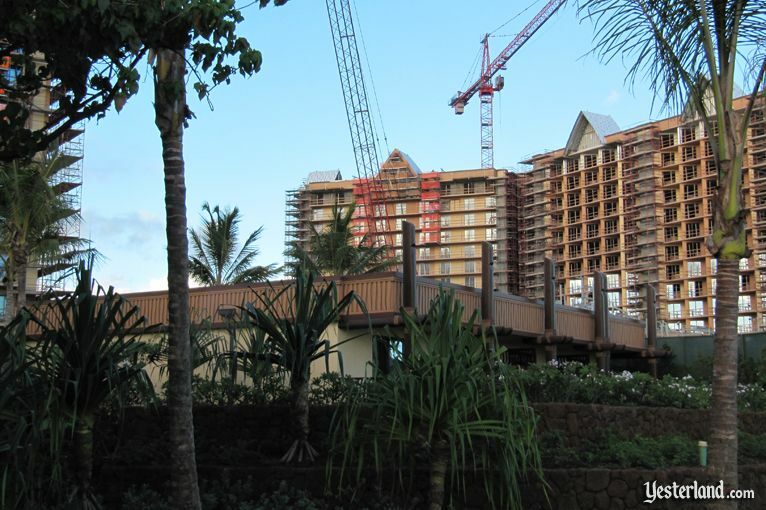 About a year from now—August 29, 2011, to be precise—youll be able check in at Aulani, a Disney Resort & Spa in Ko Olina. Disney is already taking reservations and selling Disney Vacation Club (DVC) points. 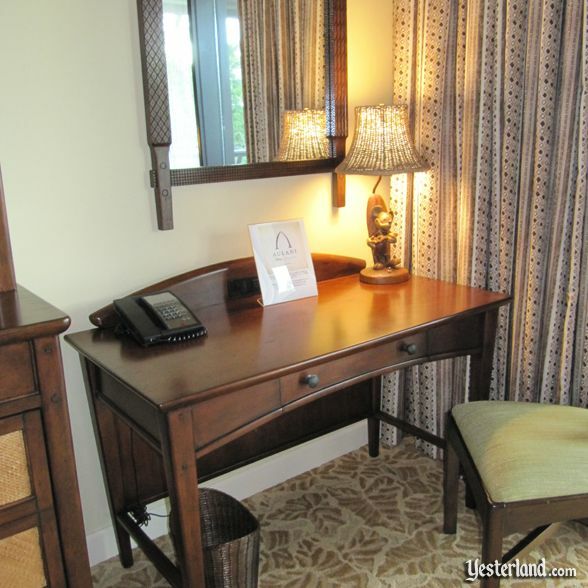 A Yesterland reader who was at Ko Olina this month sent these photos to me to share with you. Thank you! Aulani is on Lagoon 1 of the Ko Olina Resort on the leeward side of O‘ahu, Hawai‘i. 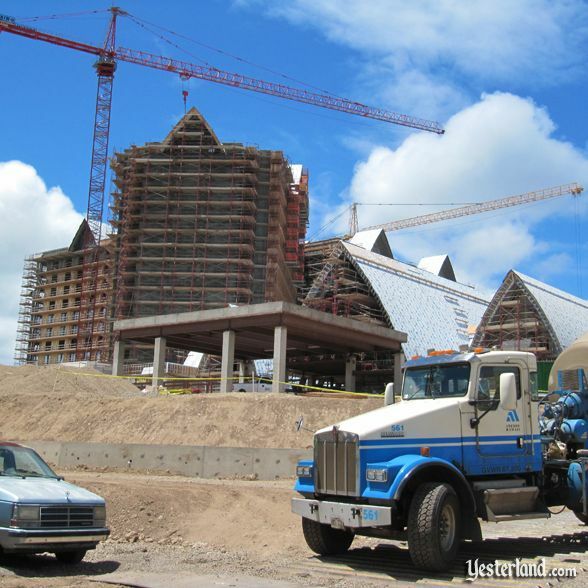 Four tall cranes still soar onto the sky above the Aulani construction site, but they probably wont be needed much longer. 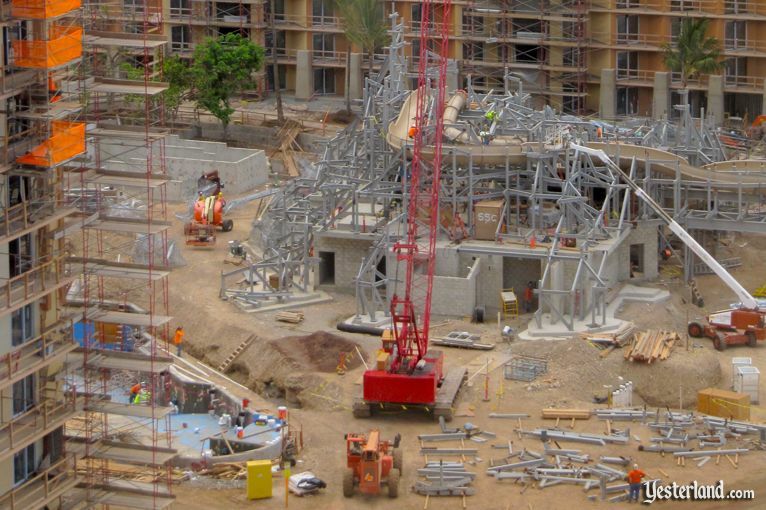 The exterior of the resorts towers will soon be complete. Yellow is Phase 1 (Fall 2011); Red is Phase 2 (Winter 2011); Blue is Phase 3 (Winter 2013). The interior build-out is supposed to take until Winter 2013. The lengthy schedule is probably due to soft tourism and languishing timeshare sales in Hawai‘i during the current recession. By waiting until the villas are needed, Disney can defer capital spending on a significant amount of interior work. 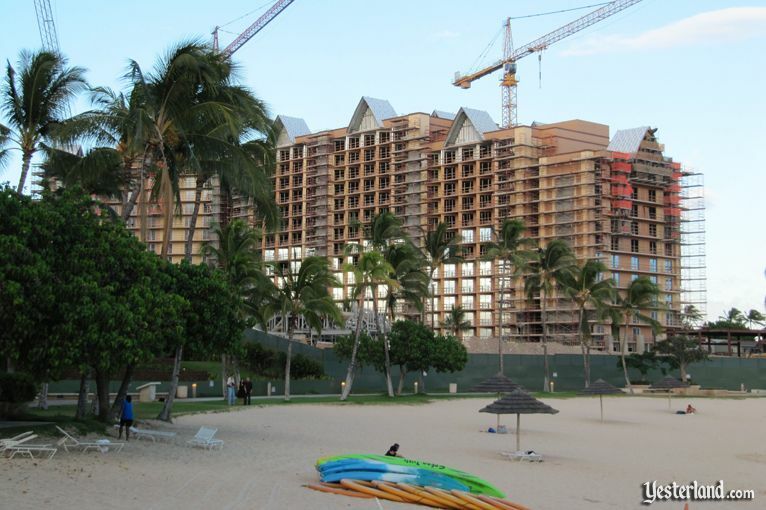 A few lagoons away at another timeshare resort, Marriotts Ko Olina Beach Club, construction of the fourth tower is on indefinite hold, and half of the third tower is just an empty shell. 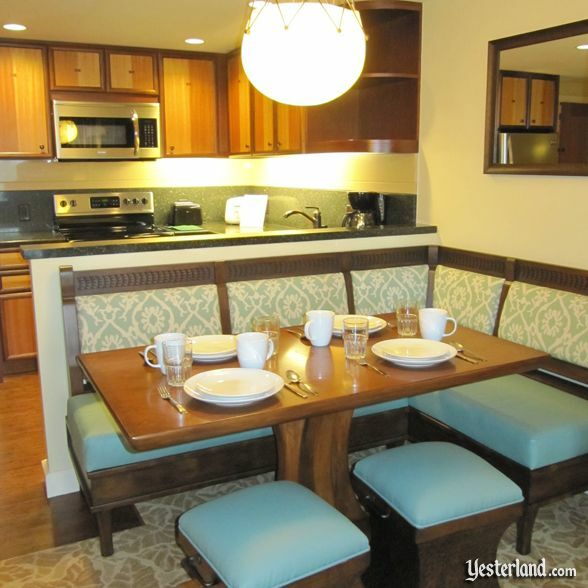 If the economy recovers more quickly and Aulani sales are strong, Disney can undoubtedly adjust the schedule to bring the Phase 3 villas online sooner. When complete, there will be 840 rooms, consisting of 359 deluxe hotel rooms and the equivalent of 481 two-bedroom DVC villas. The installation of glass is underway. Even if the interior of most of one building is an empty shell, the exterior will look complete. Thats good news for the guests in the hotel rooms and the Phase 1 and 2 villas who wont have to deal with noise from heavy construction and exterior work. The site will eventually be covered with tropical landscaping—but not yet. The steel framework for volcano Pu‘u Kilo appears to contain two water slides. Ever since Disney announced their Hawaiian resort and released the first artists rendering, it appeared that the centerpiece of the resort would be a volcano. 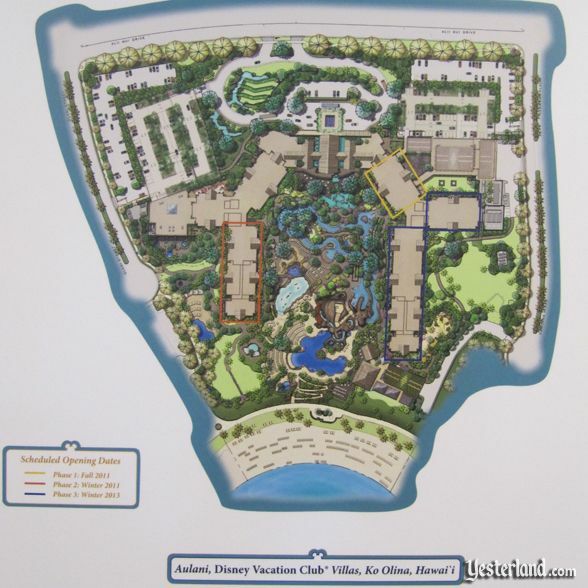 Rohde laid out Aulani’s 21 acres as a typical ahupua‘a, a traditional land division that stretches from the mountain to the sea. The resort is set in the mythical Waikolohe Valley, with landscaping that reflects the ecological transition from rainforest to valley to shoreline. Wai is the word for freshwater, and kolohe means “rascally.” (“We do have a sense of humor,” Rohde says.) There is one Hawaiian symbol that Disney resisted, though: Volcanoes. “A volcano is not believable,” says Rohde. Instead, Aulani’s landmark is mound of lava—Pu‘u Kilo—that features imagery-filled rocks. 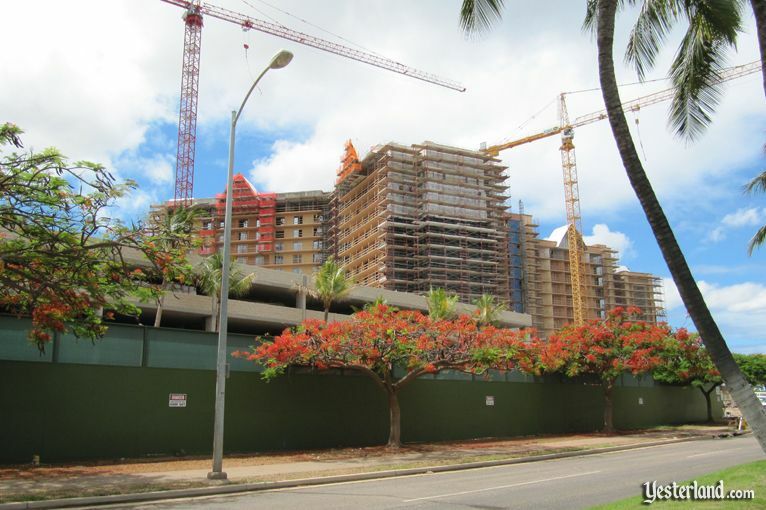 From an aerial vantage point in either of the resort’s two high-rise towers, the lava flow will look very real. You can read the entire AOL Travel article here. A green construction wall surrounds the construction site. Theres still no Disney artwork on the construction wall—only “Danger” signs. So now, here are nine pictures of what you would experience if you start at the sales office and then visit the model center. 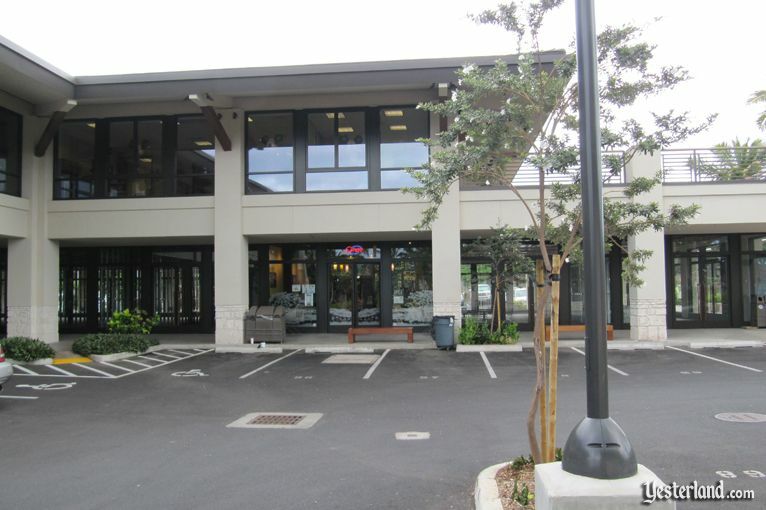 Disney now has a sales office at the new Ko Olina Station shopping center across the street from Aulani. 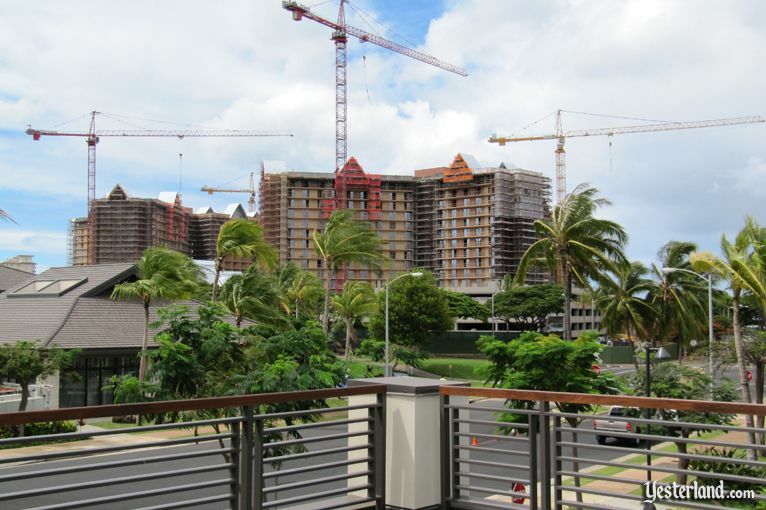 A balcony at the sales office offers a view of Aulani. 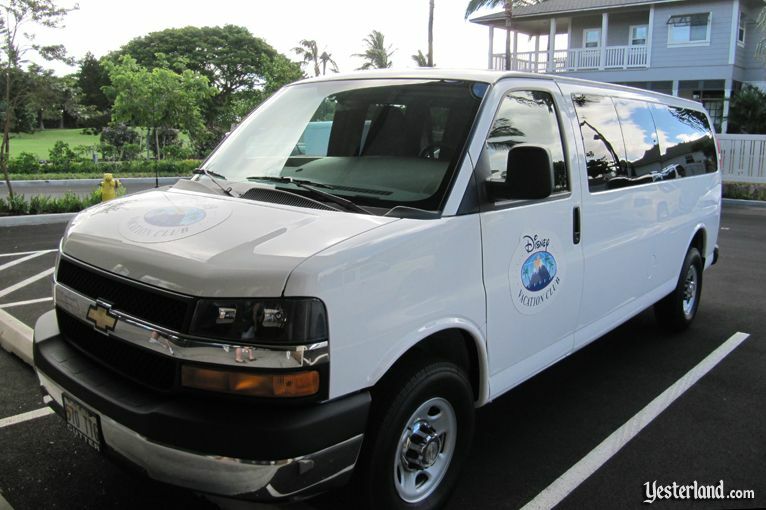 Disney Vacation Club van at the sales office. 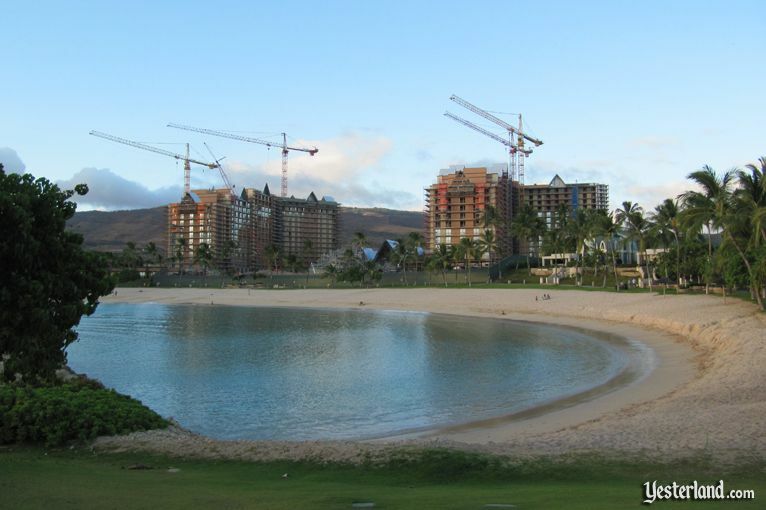 The model center is in a temporary structure on the Ko Olina Shoreline Walkway. The kitchen blends modern and Hawaiian. In this age when people travel with their laptops, its good to have a desk. 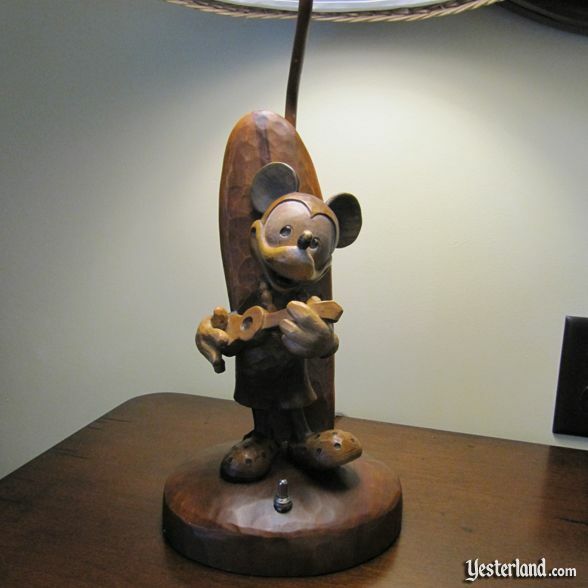 Lets take a closer look at the desk lamp. 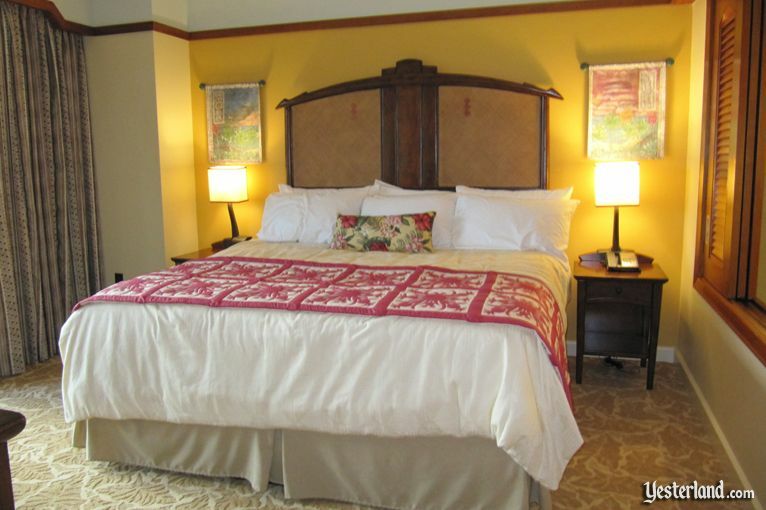 The master bedroom in the Aulani villa provides a king bed in a Hawaiian themed room. 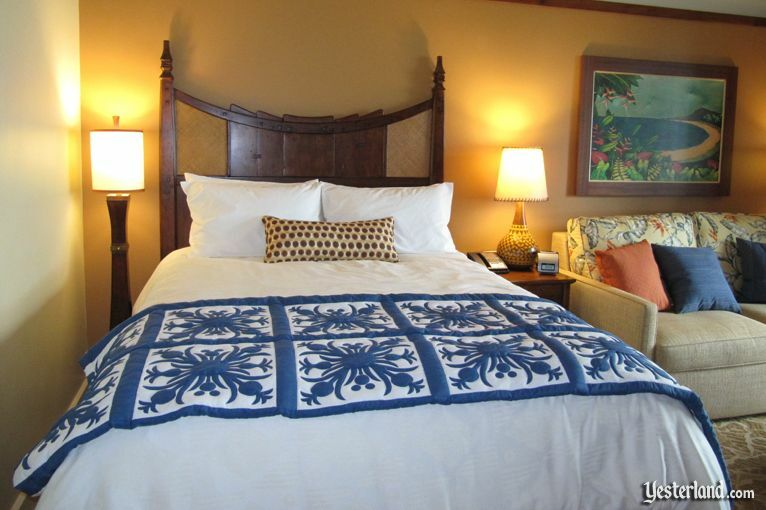 Look for the hidden Mickeys on the decorative bed scarf, inspired by Hawaiian quilts. 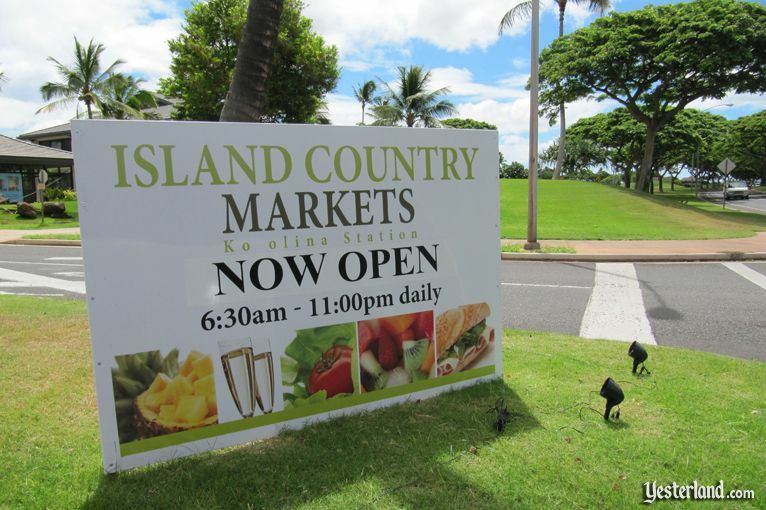 “Island Country Markets” is a new, upscale retail concept from ABC Stores. 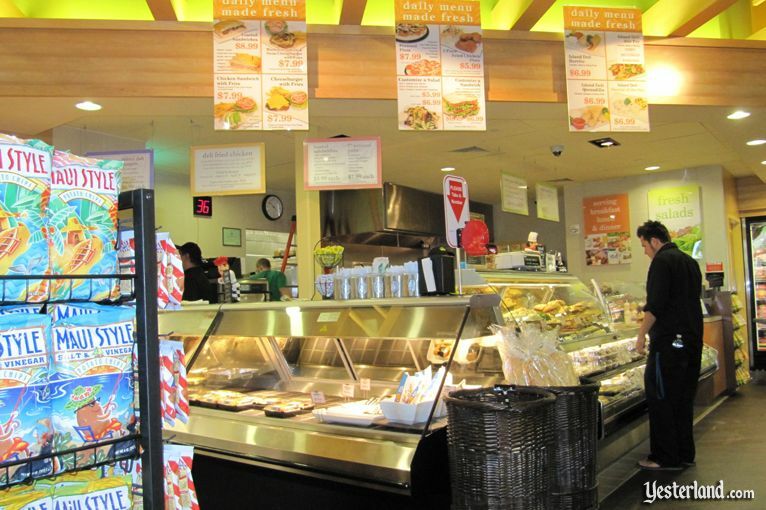 The prepared foods at Island Country Markets should be very convenient for Aulani guests. 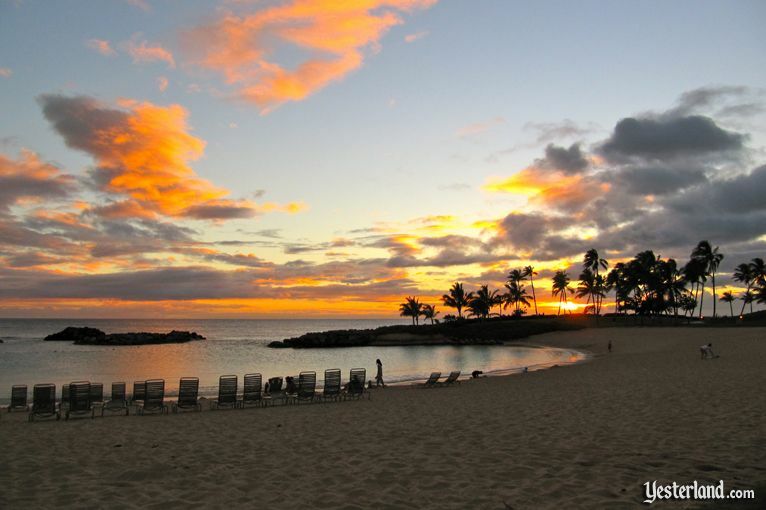 This brings us to the end of this article—and what better way to end it than with another Ko Olina sunset?